Precocking is one of the most important features of Perun V2 Optical. Fast trigger response can be a matter of victory or defeat, especially in CQB situations. With precocking enabled, piston will remain in rear position after each shot with spring already compressed, ensuring that next shot will be fired immediately after you pull the trigger. Microcontroller uses data from optical sensor to calculate current sector gear position and speed. With this information, after releasing the trigger, smart algorithms are able to transfer only enough power to the motor to make the piston stop in the correct position, or in high ROF setups, to let the motor inertia push the piston back and stop it using active breaking right. This saves your battery and reduces motor wear. Precocking works in semi, burst and full-automatic modes. Active brake - Perun V2 Optical has an active brake allowing to stop the motor after each shot. In case of double shot problem in replicas with high rate of fire, active brake will be an effective solution if you do not want to use precocking. It can also prevent compression of the main spring for a longer time, if you will fire a shot with AB on before a storing your replica for a longer time. Active brake can be switched on or off at any time in few seconds. 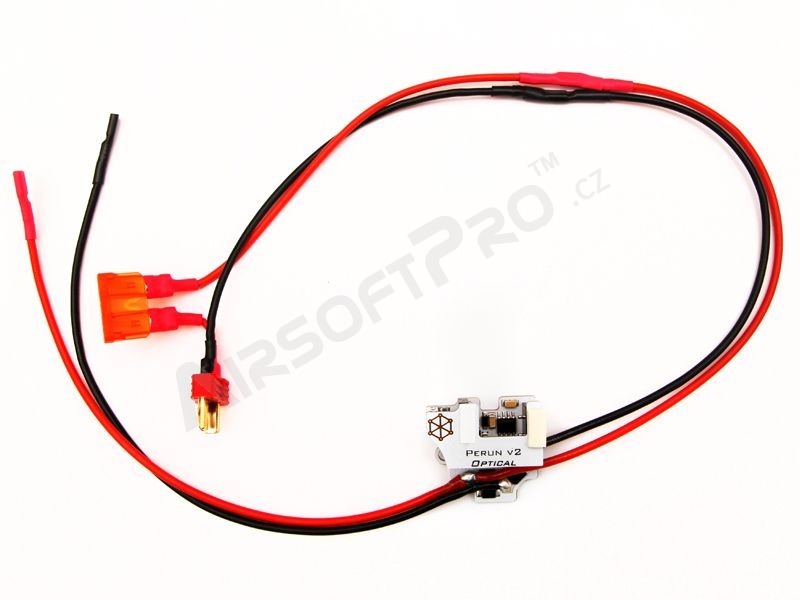 Low-resistance wiring - the integral part of Perun V2 Optical is a ready for installation low-resistance wiring based on Muldental silicone wires, which are praised by airsoft techs and widely considered best for airsoft electric guns. 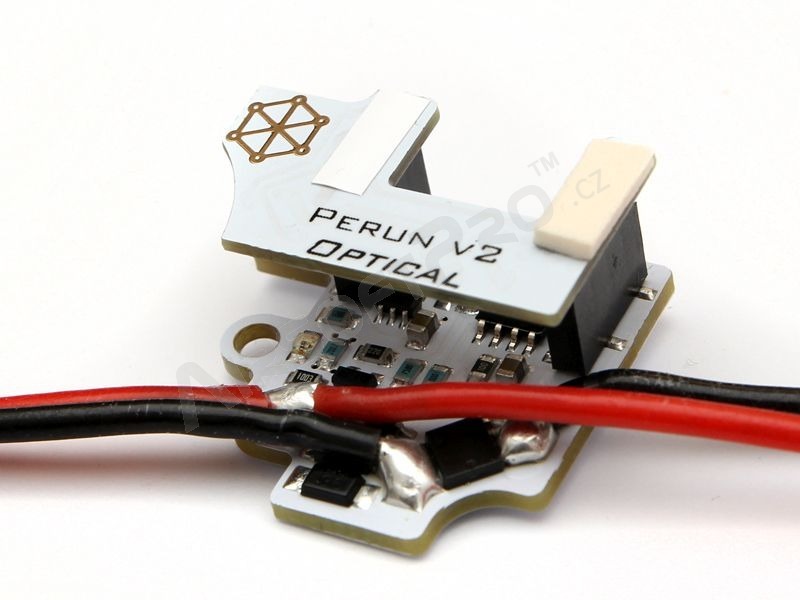 Perun V2 Optical is available both front and back wired. 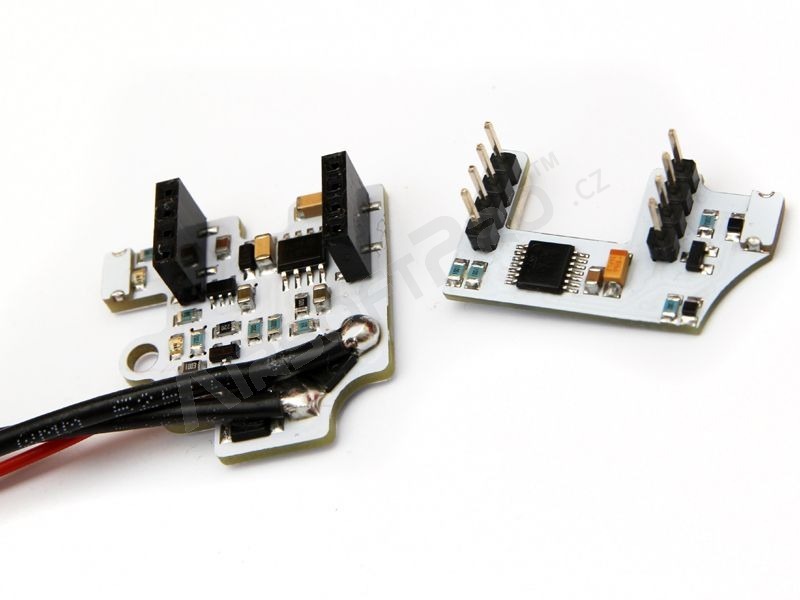 MOSFET - thanks to use of exceptionally efficient and powerful MOSFETs, the device can be used in replicas with any main spring. The maximum rate of fire is 50 RPS. Perun V2 works well with DSG setups, because optical sensors are not subject to mechanical stress seen in high ROF setups. Tests have shown that in some DSG setups precocking may be less reliable and has to be disabled. However, ROF provided by DSG makes use of precocking rather unnecessary.